I can often be spotted, on a lazy Sunday afternoon, dragging LT out of the shed and up towards Harlech Castle. 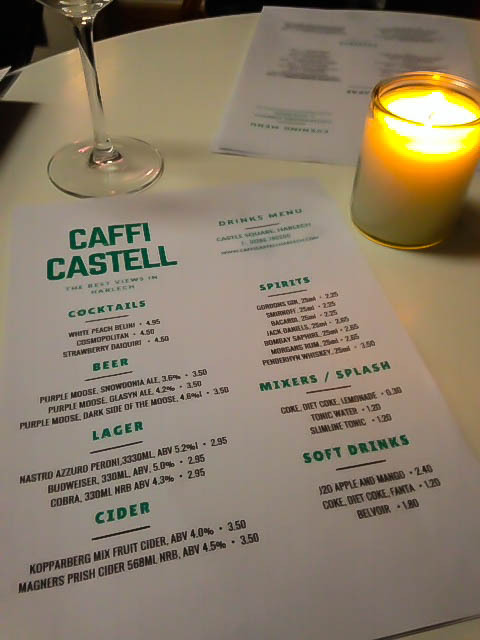 This is largely because I love coffee, but also because the views from Caffi Castell are spectacular and, when you walk in, you're guaranteed a warm welcome from the staff. We found the original Llew Glas Cafe during our first week living in Harlech and, even though we've moved a wee bit further south, we still go up as often as we can for some Sunday chat and to chill out before the madness of Monday hits us again. 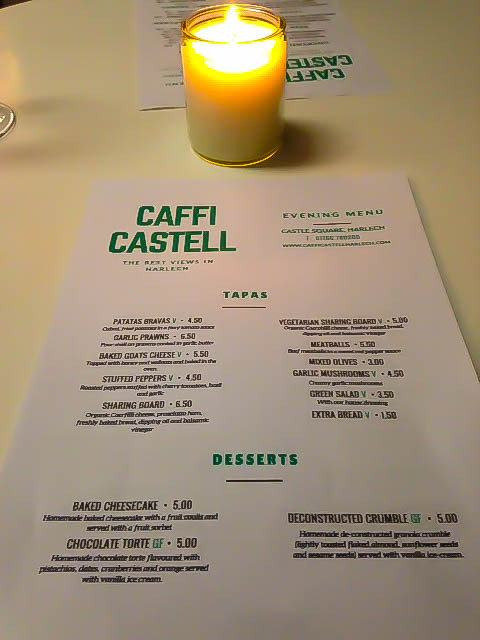 This week, however, we found out that Caffi Castell was starting a new evening menu, so we were very excited about that. 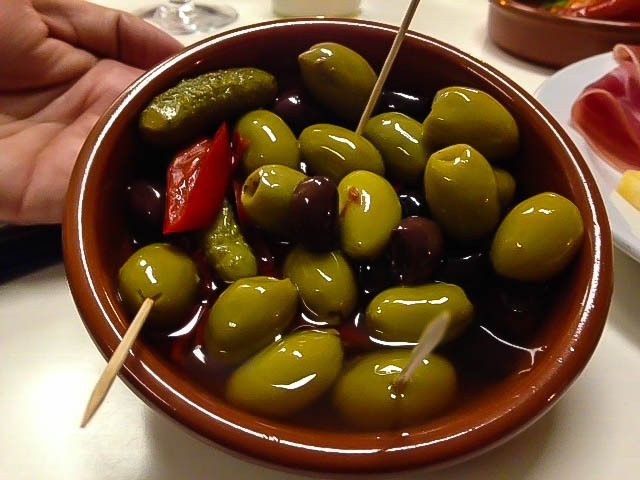 We were even more excited when we realised that the food on offer was Spanish tapas...and they have a licence to serve wine. There are few things that make me happier than gazing at Harlech Castle, with my favourite people, favourite food, and a glass of Rioja. Muy bueno. I even washed my hair and changed out of my jamma bottoms for the night. And that doesn't happen too often. The Caffi only opened its doors the previous evening and was already full when we arrived, save our little table for four. 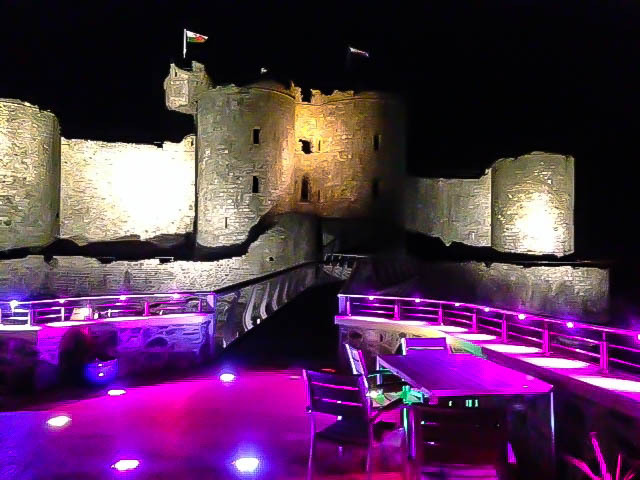 The lighting outside the castle was, as always, beautifully striking and the interior, despite being at capacity, has enough space to make your dining experience feel intimate and romantic. I'll have one of everything, please. Tres botellas de vinto tinto, por favor.. 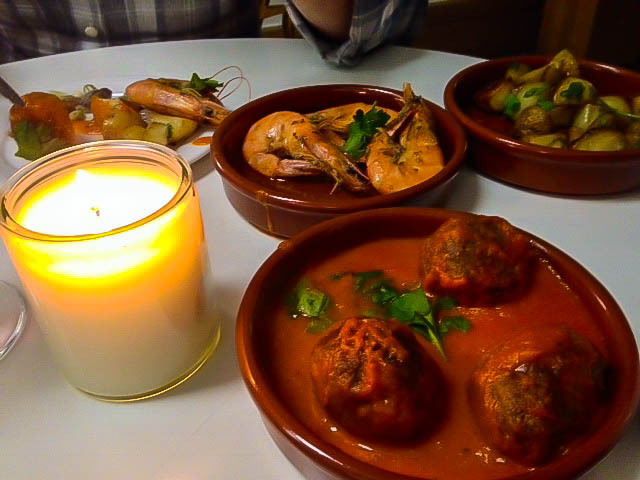 The menu mainly consists of classic dishes, such as patatas bravas (spicy potatoes), albondigas (meatballs), olives (because obviously), stuffed peppers, garlic mushrooms and garlic prawns, to name a few. There is also a great veggie and gluten free selection for those of you who don't eat meat...or gluten. In addition, there was a very tempting cocktail menu, which I'm definitely trying next time. On this occasion, we stuck with Rioja, because it's my favourite wine and, well...we were eating Spanish food and it would be rude not to. Not that I need a reason to bust open a bottle of Rioja, you understand. The food was glorious and served in authentic terracotta pots, delivered to the table with a smile and satisfaction check (once a VS inspector, always a VS inspector...) Don't judge me, I can't help it. I'm hungry just looking at this. I could live on these, I reckon. We ate, drank, and became rather merry over the course of the evening, indulging in way too many calories and excellent red wine. 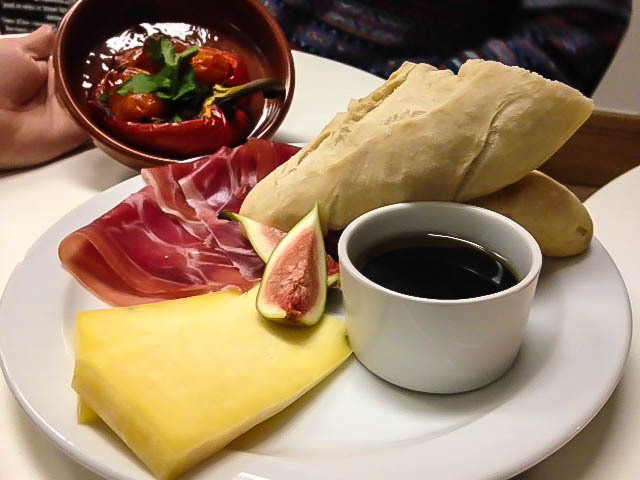 For four people, each ordering three tapas, extra bread (naturally), a lovely bottle of Rioja and three desserts totalled £120. This was promptly paid for by the boys, so really my dinner was entirely free. You can't really ask for more than that, can you? ?